A study of five spiritual values under the headings: All Spiritual Blessings, Rags or Robes, All of One (Heb. 2:11), The Lord's Anointed, and Satisfied. ‘All Scripture is given by inspiration of God (theopneustos-God breathed), and is profitable for doctrine, for reproof, for correction, for instruction in righteousness: that the man of God may be perfect, throughly furnished unto all good works’ (2 Tim. 3:16,17). Most of us have heard of the legend of King Solomon’s Mines but there is a Mine that is not connected with legends, to which we have free access, namely, the Word of God. This is His truth given to us, in which we can keep digging, and unearth by the Spirit of God, gems that in splendour outshine all the glory of Solomon; that reveal to us the One Who was, is, and always will be greater than Solomon, Christ Himself, the One Who for a time, for us, gave up that glory and all it signified, so that we might be manifested with Him in glory, redeemed by His precious blood. With the persistence and energy of the miner in mind we think of Charles Welch and his labour and zeal over the many years, unearthing Truths in the Word of God. In these days of apostasy, apathy and opposition to God and His wonderful Salvation in Christ, I, and to be pertinent, all believers who desire to go on to perfection (the end or goal) need so much the truths of his labours to build us up in our most holy faith and that as set out in 1 Peter 3:15 we may sanctify the Lord God in our hearts: and be ready always to give an answer to every man that asks us a reason for the hope that is in us, with meekness and fear. Not only does the author ‘dig’ with all his energy, but, like the lapidary, he polishes and makes these gems of Truth scintillate with a foretaste of the glory that is to be ours in due time. In this book he has ranged through the Scriptures dealing with such subjects as ‘Satisfaction’, ‘Immortality’, ‘Oneness’, ‘Forgiveness’, ‘Bread of Life’, ‘Redemption’, ‘Deity of Christ’ etc. His aim and object, as it has been throughout his life, is to glorify God and His Son our Lord Jesus Christ in all the Scriptures; to be an earthen vessel, always in his writings and expositions, exalting Christ. 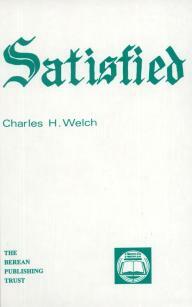 Here is an exposition of Dispensational, Doctrinal and Practical truth not to be ignored by those who love the Lord Jesus Christ, a book not to be hastily read, and placed in the library, but to be perused and studied with the Scriptures beside one, for the author’s aim and object is to lead us to be ‘Throughly Furnished’. This can only be accomplished by recourse to the Scriptures themselves, but we also should praise God and thank Him for men such as Mr.Welch, who have given us the aids to understanding the Word of God. With grateful thanks which I am sure will be echoed by all who study this book, I pray for the author and all associated with him in this publication. W. H. H. 9th Sept. 1962.